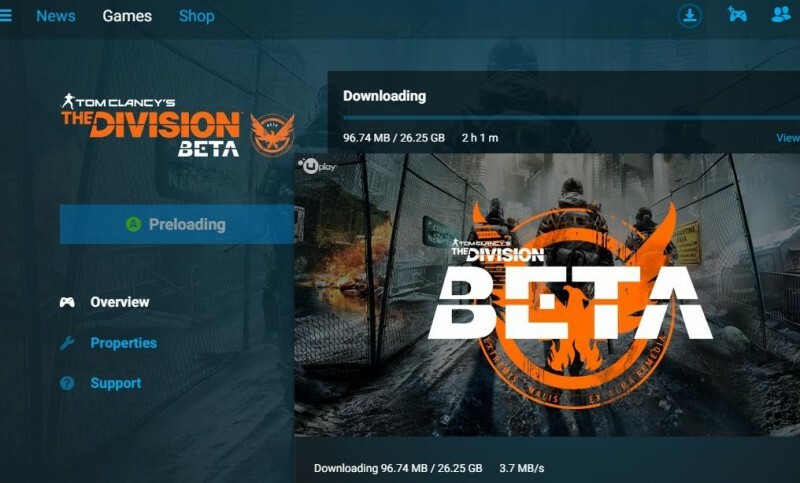 How much space will you need on your hard drive to install The Division’s upcoming beta? On PC, the game’s beta client weighs in at 26.25 GB, according to someone with early access to it. Reddit user legate213, who claims to have been invited to a “private beta” that starts today, January 20, published a screenshot of the download within Uplay, revealing the file size. The image has since been removed, though not before it was captured by VG247. By comparison, the Xbox One alpha client was 23.2 GB. Ubisoft has yet to announce the file sizes for the Xbox One and PS4 beta clients, though that information should come soon, as the closed beta begins on January 28. On that day, Xbox One owners who preordered The Division can start playing, while PS4 and PC users can get started January 29. The beta ends on all platforms on January 31. The only way to guarantee yourself access to The Division’s beta is to preorder the game. However, Ubisoft has also confirmed that you can sign up for a spot on the waitlist for a chance to get in. Beta players can explore “early story-driven missions” on Manhattan’s Chelsea Pier, while people in the pre-release play period can also try the PvP Dark Zone. After multiple delays, The Division’s full release is now scheduled for March 8 across Xbox One, PS4, and PC. For lots more on The Division, check out GameSpot’s roundup of everything we learned about the game recently. Next articleUncharted 4 Branching Dialogue — "We're Not Making Mass Effect"